Hello Reader, Today we are sharing with you 'Reasoning' book prepared by 'PARAMOUNT Coaching Center' pdf in English language. All Chapters' questions given in this book have been solved by the Paramount team's own concept, and given wonderful explanation. This book is very useful for SSC, BANK and other competitive examinations. 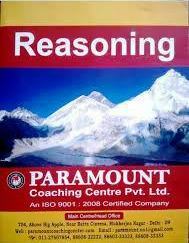 If you are preparing for a competitive exam, you can read this book for better preparation of reasoning. You may download pdf from the link provided given below.